Jessica started making bows for her little girl, Jillianah, and fell in love with the creativity it allowed her to express! She can do custom orders, but has ready to ship items on hand. I am completely honored that she asked me to review some of her bows! Being a mother of two girls I am a total bow freak! Jessica not only works with you but makes sure you are completely satisfied and let's just say her bows are seriously adorable AND affordable, my two favorite words when it comes to bows. She doesn't only make bows either, she makes korkers, clippies, stacked boutique bows and pinwheel bows! She's extremely talented and highly recommended! With that being said, we are in love with our new bows! Jessica sent us a pink korker set, purple korker set, zebra korker set, purple basic boutique set, blue & white flower bow, stacked boutique bow, pink pinwheel bow set, and a yellow seahorse clippie! Jessica went above and beyond for this review! Everything is super colorful and absolutely adorable. These are actually our first korkers in the girls collection, I've always been so hesitant about purchasing them because I thought they looked kinda funky but let me tell you these things are absolutely adorable and they make piggy tails look gorgeous!!! 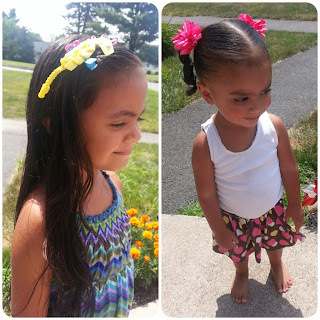 Lilyana is in love with the seahorse clip and Sophia loves the stacked boutique bow! Jessica's bows are definitely one of a kind! 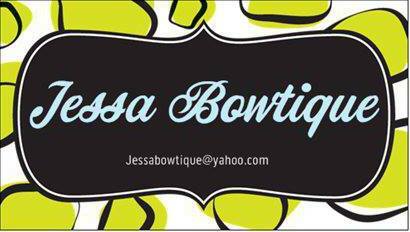 Jessica is giving one of my lucky followers a $10 gift card to her Bowtique! One (1) winner will receive: A $10 gift card to Jessa Bowtique. Ends 7.29.13. DISCLAIMER: All products received are complimentary for testing purposes from Jessa Bowtique. All opinions stated are my own and are not influenced by any affiliates. Amazing! She does beautiful work! The bows are amazing! Jada would be so super cute in them! Those are adorable and I know my 3 girls would be in love them! P.S. Your girls are too cute! These are so cute, If i had any little girls for them to go to I would enter, good luck to everyone else. I don't know that I could pick just one - but that Minnie Mouse bow is ADORABLE!! I love bows. Now that my girls are getting older, they don't love them so much. Her work is amazing, my grand daughters love bows. Super cute! thank you so much for the fun contest! The corkscrew bows are so cute! These are so cute! I have got to get some for my niece! I love all the bright and cheerful colors! Plus all her work looks very nicely done and high quality.